Super Soup Challenge – The Roundup! I shouldn’t say I don’t ever bake. It’s certainly a rarity, though. I have a few things in my arsenal that are sure things. I quietly make the best cupcakes I’ve ever had – my friends can vouch for those. I break out my mom’s cookie recipes at the holidays for a select group of people. Every once in a while, I get a wild hair for a tart or something…but even that often ends up being some quick little savory something rather than sweet. Why don’t I bake? In examining yet another one of those psychology and food connections, baking = love. It’s an often time-consuming process with a good bit of effort that takes a lot of tending to…but ultimately comes down to chemistry and timing, See? It’s just like love. (I kid – kinda). I realize I have friends who all have a rabid sweet tooth…but there is an intimacy to making dessert that I just can’t share with most people. So when I decided to make dinner for The Boy, I was in a mild-to-medium twirl. Due to our schedules and such, I have made meals for and with him…but I hadn’t cooked for him. I fretted over the menu for a good four days. I got in a kerfluffle about the timing and the combination of tastes. Would all of the dishes go together? I alternated wringing my hands, flipping through cookbooks, and fidgeting. When the evening finally arrived, it all came together like a dream (editors note: i also had time to put on a dress and some lipgloss on before he got there). The roasted chicken, the asparagus & goat cheese salad, the mushroom gratin…and dessert. That I baked. From scratch. 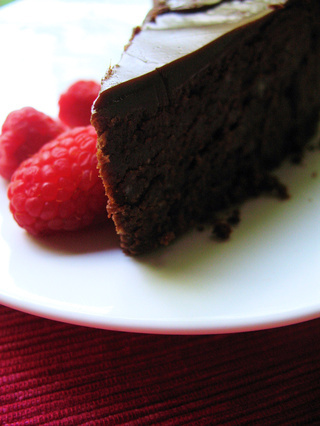 This glorious chocolate espresso cake – he does like his chocolate desserts – that has more the texture of a flourless cake or a torte. That meal…that evening…and that dessert was very symbolic of our time we spend together: simply delicious and deliciously simple. FOR CAKE: Preheat oven to 350 degrees F. Butter and flour 9-inch diameter nonstick cake pan. Melt chocolate and butter in heavy medium saucepan over low heat, stirring constantly until smooth. (Do not burn.) Stir rum and espresso powder in large bowl until espresso dissolves. Whisk sugar and eggs into espresso mixture to blend. Whisk in vanilla and salt. Stir in warm melted chocolate mixture, then flour. Transfer batter to prepared pan. Bake until cake just puffs in center, about 45 minutes. Cool in pan on rack, 15 minutes. Cake will deflate as it cools; guide edges into pan as it cools. Run small sharp knife around edges of cake. Turn cake out onto rack and cool completely. FOR GLAZE: Stir rum and espresso powder in small bowl until espresso dissolves. Bring cream and butter to boil in heavy small saucepan. Remove from heat, add chocolate and stir until smooth. Stir in rum mixture and corn syrup. Let glaze stand at room temperature until no longer hot, but still liquid. Place cake on 8-inch cardboard cake round. Set cake on rack over baking pan. Gradually pour glaze over cake, covering completely. Chill until glaze is set. Cake can be made 2 days ahead. Keep cake refrigerated. it was awesome! I still dream about that meal…. Ah yes, once again the seperation of cooker and caker. I really do think deep down you are one or the other. I mean no one would say I am a bad cook(cause I’m not) but my passion will always be to bake. Yet I have friends who are the complete opposite. Looks like you had a wonderful menu for you and the boy. That cake looks lovely, but have you shared your cupcake making secrets? If not, will you ere long? I just had a similar cake at a restaurant here in Austin and it was amazing. I’m saving this for the future. I’m with you. When I’m in the kitchen it’s cooking not baking that I do. That’s what I do best. I have fluked some lovely classic sponges etc and do have a few easy standby recipes like iced lime and coconut cupcakes, Lucy & Greg Malouf’s Lemon Syrup cake and a choc-ginger-macadamia brownie, which conceal my inner resistance to bake. But it surfaced when I recently had to turn down a friend’s request to make their large two tiered, square, chocolate mud wedding cake covered with ganache for 60 plus people. It brought home that I just wasn’t equipped to deal with 6kg of couverture and whatever else. In fact, I’m such a non-baker that I don’t even own a mix-master! I raise a glass to the bakers of the world and their heavenly concoctions – bravo! Thanks for the information…I bookmarked your site, and I appreciate your time and effort to make your blog a success!